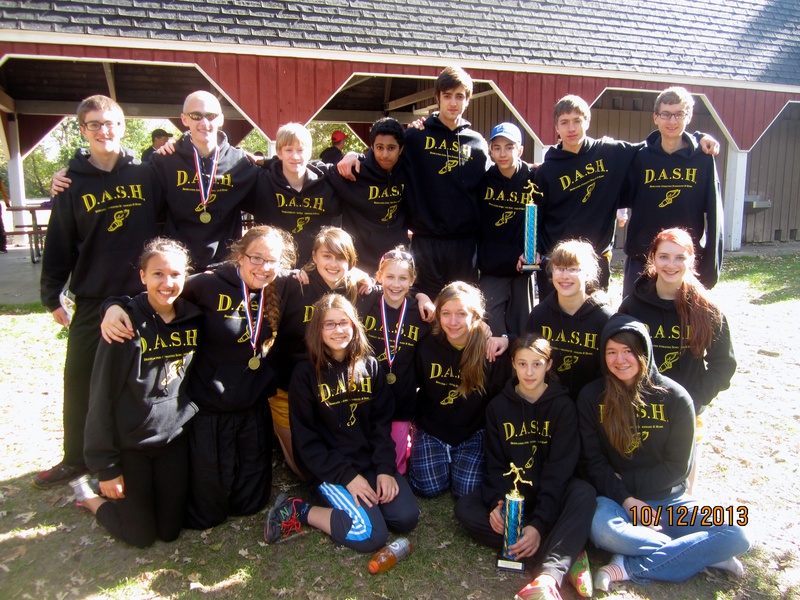 The DASH high school varsity track team was found competing at Sussex Hamilton last Wednesday against eight teams, including six at the Division 1 level. It would be some of our stiffest competition of the season, and would hopefully push us along to some very good times. It was chilly with a threat of rain in the forecast, but we stayed dry and competed at a high level for the duration of the meet. The boys 4×800 team got the days running events started. Liam Westhoff took the baton around the first two laps in 2:22 for the teams’ best split. 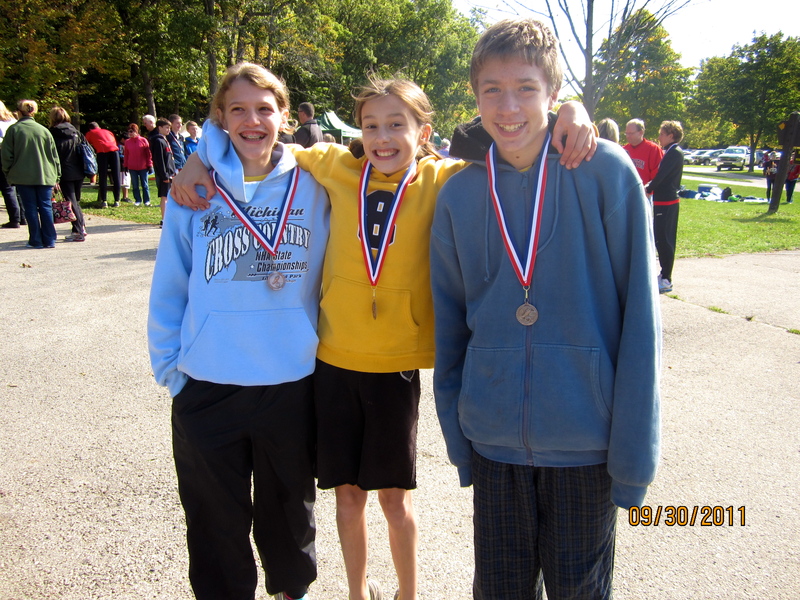 Then Jacob Parker, Joshua LeSac, and Vincent Maurer took their turns for a 5th place finish in 9:42. Grace Zinkgraf got through the 10 hurdles in her path in just 19.46, lowering her own DASH record in the process. Shariah Hyler posted the best time of any 100m DASH hurdler not named Grace with her 20.47. Annmarie Bridge was nervous before her race, but after the gun went off she found some courage and got through the hurdles like a veteran. The coach liked her 25.37 time. Joshua Below came through with a personal record 21.08 in the 110 hurdles. Then in the next heat, Noble Holmes smashed his own DASH record with a 19.23 to place 4th overall. That was impressive and was one of our best results on the day. To great fanfare, Annmarie Bridge was back for the 100 meters and did an 18.10. Stephanie Chu won the heat with a nice 15.26. In the next heat, Terez Wycklendt was pushed to a personal record 13.77 and placed 5th overall. She is fun to watch. Our boys all ran in the same heat. Briel Holmes did a DASH record 12.00 for 9th overall, and Jared Aguilar held off a charging Perryon Pierce while posting a 12.76 time. Perryon was easily the best freshman in the race. In the 1600, Abby Chu got off to a slow start, but then got back on pace to finish with a 6:09. Emma Taylor was not pushed much and coasted to a 7:05. Senior Katrina Lipski got under her personal best time set as a freshman with a 7:28. Caleb Schaber was the early pacesetter in the boys 1600 race. Caleb settled for the 3rd place medal, but with a big personal record 4:51. Alexander Taylor looked like a freshman this time out while posting a 5:31. Matthew Schaber looked smooth while getting his pr down to 5:54. In the 4×200, the girls team of Grace Zinkgraf, Alivia Kempf, Jaimee Heckenkamp, and Shariah Hyler hit their seed time with a 2:08. The boys team placed 4th overall while lowering the DASH record to 1:42.55. Jacob Parker, Joshua Schaber, Kevin Egan, and Briel Holmes are the record setting team for now, but it will be threatened again next week. In the 400, Rebecca Doak did her lap in just 1:07.94 to place 6th. Terez Wycklendt ended up 5th overall with a personal record 1:06.13. Those are the kind of results we were hoping for from our 400m stars. Jared Aguilar hasn’t run a lot of 400 races other than the 4×400, but he made the most of his chance and was our first guy in with a fast 57.10. Liam Westhoff finished well and did a 58.12, and Ben Hughes struggled to a 59.32 and was done for the day. We need to get him healthy. The girls 4×100 team of Grace Zinkgraf, Jaimee Heckenkamp, Emma Taylor, and Shariah Hyler beat their seed time and were just a half second out of the medals with their 1:01 4th place showing. Then a DASH record 49.56 earned our boys team of Perryon Pierce, Jacob Parker, Noble Holmes, and Joshua Schaber a 5th place finish. The hurdles were out again, and Annmarie Bridge got through the 300 meters and 8 hurdles very well, but she pushed the 6th hurdle with her hands and got a DQ. Alivia Kempf placed 9th with her 57.81. Kevin Egan jumped over all 8 hurdles this time and hit the finish at 48.68, not far off the DASH record. That effort put Kevin 5th overall. Joshua Below is rounding into form now, cutting off over 2 seconds from his time last meet to place 8th with a 49.25. Ben Forget got the call for the first time in the 300 hurdles and posted a respectable 53.42. He will do them again. In the 800, Abby Chu got her time down to 2:46. Emma Taylor did not look confident while coming in just under 3:00. Alivia Kempf had the tough task of doing the 300 hurdles and 800 meters back to back. She hit the finish in 3:02. Respectable. Vincent Maurer set an 800 pr of 2:25. He paced ahead of Alexander Taylor who crossed the finish in 2:30. Caleb Schaber then put in a 1:02 first lap on his way to a personal record 2:09. He is getting very close to the DASH record now. In the 200, Rebecca Doak was our first runner in with a 30.59. Stephanie Chu was a few steps back at 31.70, and Jaimee Heckenkamp was clocked at 35.21. Joshua Schaber edged Noble Holmes with both boys setting personal records in the 25’s. Very nice. Then Briel Holmes was on the track lowering his own DASH record with a 24.16 for 5th place overall. He looked very strong. Drake Hacker was finally back running his favorite event, the 3200. Drake locked himself into 4th place early and pounded out the laps for an 11:07. Joshua LeSac pushed himself to an 11:39. The sun was now seen in the distance as the 4×400 teams got ready. We would not be getting wet today. Our girls were seeded 5th, but Terez Wycklendt put us in 4th place early with her 1:06 split. Then Abby Chu and Stephanie Chu kept the baton moving fast with sub 1:10 laps. Rebecca Doak got the baton with a comfortable lead over 5th place. 4th place would be ours with a nice 4:35 time. The boys race was very similar. Jared Aguilar put us in 4th with a great 56 second split. Then Liam Westhoff and Kevin Egan got the baton to Caleb Schaber with a comfortable lead over the 5th place King team. King got a little closer through the final lap, but we knew Caleb had another gear available if needed. Our 3:54 time gave us yet another 4th place finish, and another great day of DASH racing was in the books. But of course we had done plenty of field events while the track was in use. Lake Holmes placed 5th in shot put with a 27’7″ throw. Rebecca Doak and Annika Lipski both hit outdoor personal record marks as our throwers continue to impress. Ben Forget led the way for the boys with a very nice 28’2″ effort, while Joshua Below gave us a 26’9″ personal best throw. In discus, Lake Holmes hit 78′. Grace Zinkgraf went past 66′ in her best result to date. Annika Lipski scratched her first two attempts and settled for a 39’8″. She has the coach’s attention. Of course I have another DASH record to report for Noble Holmes. His new discus personal best is 89’11”. Alexander Taylor had a respectable 59’3″ throw. In triple jump, Alexandria Sherman opened her season with a 28′ hop, skip, and jump. That put her 7th overall. Emma Taylor managed a 21’4″ when hopping off the correct line. Alexander Taylor went past 27′. Joshua Below was measured at 28’3″, and Liam Westhoff broke his own DASH record with a 35’9″. We still need to get the camera on Liam while he is recording such feats. Alexandria Sherman also placed 7th in the long jump after going past 13′. Stephanie Chu had a great personal record 12’9″ effort, and Shariah Hyler did an 11’4″ in her first try at long jump. Briel Holmes launched himself to the 18’11” mark this time. That was good for 5th place. Joshua Schaber went past 17’6″ which is an outdoor personal record for him. Noble Holmes gave us three jumpers over 17′ and was the top freshman in the event. That was a lot of good results to report on once again. We are starting to get in peak form now, and the results are showing it. And we need to be peaking as we are already down to our last 4 weeks. 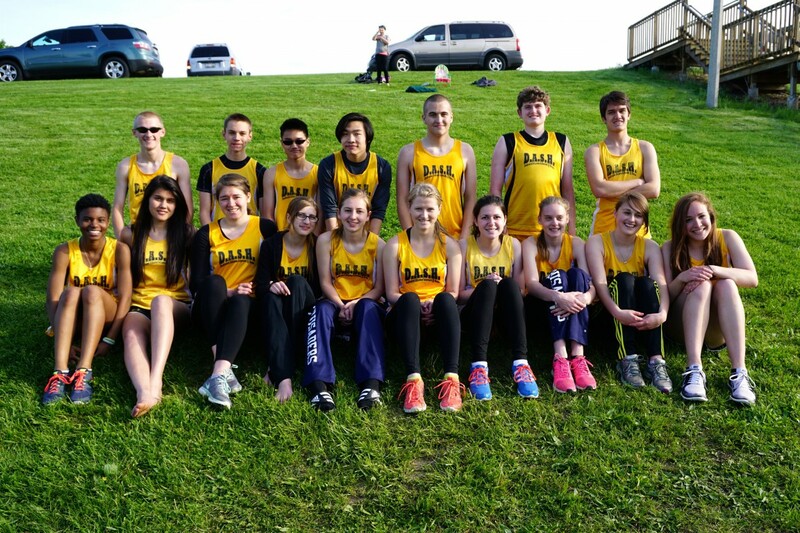 Track season goes by so fast. The team will be splitting up next week. The girls and about a dozen boys will be at Kettle Moraine Lutheran next Thursday. Then on Friday about 18 varsity boys will be at the always exciting Pacer Relays. Another big week of racing is upon us. I hope to see you there. Thanks to the coaching staff of Ed Beck, Chuck Maurer, and Garrett Missiaen for being on hand. Thanks to the folks at Sussex Hamilton for welcoming us with an invitation as I was scrambling to find us a meet for this week. Thanks to the official crew which included our favorite, John Miller. He is so nice, he actually apologized to me when he had to disqualify Annmarie from the hurdles. John also left our camera crew of Julianna Caspers and Grace Caspers plenty of leeway to find good spots to take the photos. A late-arriving Faith Caspers also helped out during the 4×400 and post-race photos. Now we have a short break where we can reflect on the sacrifice Jesus made for all of us on the cross, and also upon his victory over death on Easter. The 2019 DASH high school track and field team got its outdoor season started as planned at Kenosha Tremper high school yesterday in the Lancer Invite hosted by Kenosha St Joseph’s. The track does not show up on Google Maps. It is 9-lanes and brand new. This would be the first time it was ever used for a meet! And it felt so good to be able see our full team in action, and competing in nice weather, at such an early date this year. Finally the disastrous weather that left us with so few meets last year seems like a distant memory. We need an early meet like this with no roster limitations per event to get lots of times and marks for each athlete. We left having a much better feel for the abilities of each athlete. And now the coach has a better feel on how to meld everyone’s talents together to field our best team in the big meets ahead. Now for a rundown on the running events. The boys 4×800 team of Liam Westhoff, Joshua LeSac, Vincent Maurer, and Caleb Schaber came through with our first win of the day, and they did it convincingly, hitting the finish 38 seconds ahead of second. The girls 4×800 team of Emma Taylor, Katrina Lipski, Alivia Kempf, and Abby Chu kept it close, but settled for 2nd, 9 seconds back. Then the 100 hurdles were out, and Grace Zinkgraf burst out of the blocks, took the lead, and was nearly flawless to the finish. Grace’s winning time of 19.89 breaks her own DASH record. For the boys in the 110 hurdles, freshman Noble Holmes proved to be as good as advertised, coming through with another DASH record with his 20.11 time. Joshua Below finished right behind Noble with a personal record 20.24 despite being elbowed by the hurdler next to him. In the 100 meters, Annika Lipski posted a pr time of 18.09. Mary Katherine Sanchez was just a half-step behind with a 18.25. Freshman star Terez Wycklendt was saved for the final heat and won the 3rd place medal with her fast 14.13. Now we will work on getting her to use a starting block. For the boys, Luke Smrecek ran about his same usual time as last year. I may push him out longer. We had four in the next heat with freshman Perryon Pierce coming out ahead with an impressive 12.72 for 8th overall. Kennard Taylor did well and posted a 13.58, just ahead of Nathan Forget. Jerimiah Maxie strided in next clocking in at 13.84. In the next heat, Jared Aguilar was in the high 12’s, with Ben Hughes following with a 13.32, followed by Parker Lentz’s 13.61. In the last heat Briel Holmes was one of five guys that separated themselves from everyone else. Just .17 seconds separated them all. Briel’s 12.17 put him 4th overall, just .01 behind 3rd. Freshman Alexander Taylor posted a nice 5:24 time over 1600 meters. Only in the Wisco Mile last year was he ever better. Matthew Schaber lowered his pr by 35 seconds with his 5:59. He is really coming on now. We had to put together a last-minute girls 4×200 team. Grace Zinkgraf, Emma Taylor, Alivia Kempf, and Stephanie Chu stayed close to 2nd, but settled for 4th. We had two boys 4×200 teams. 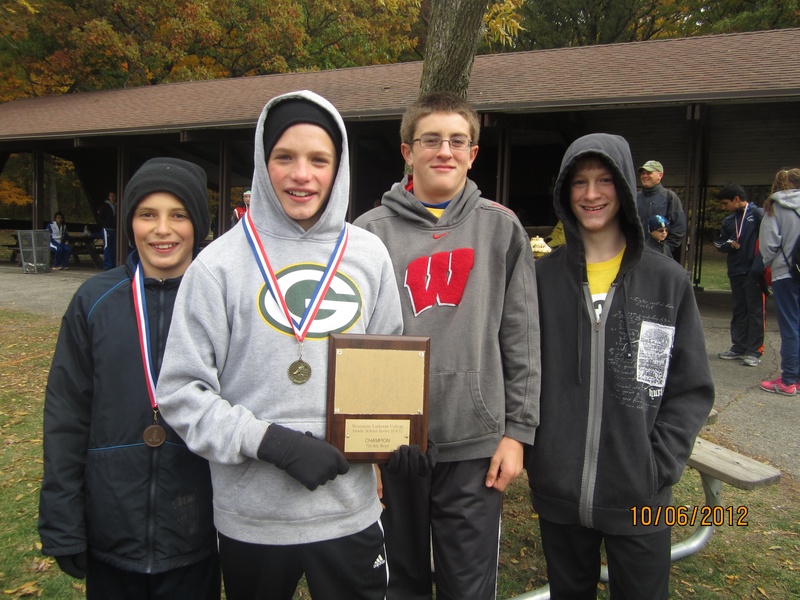 The coach liked Ben Forget, Matthew Hein, Nathan Forget, and Joshua Below’s 1:50 time. 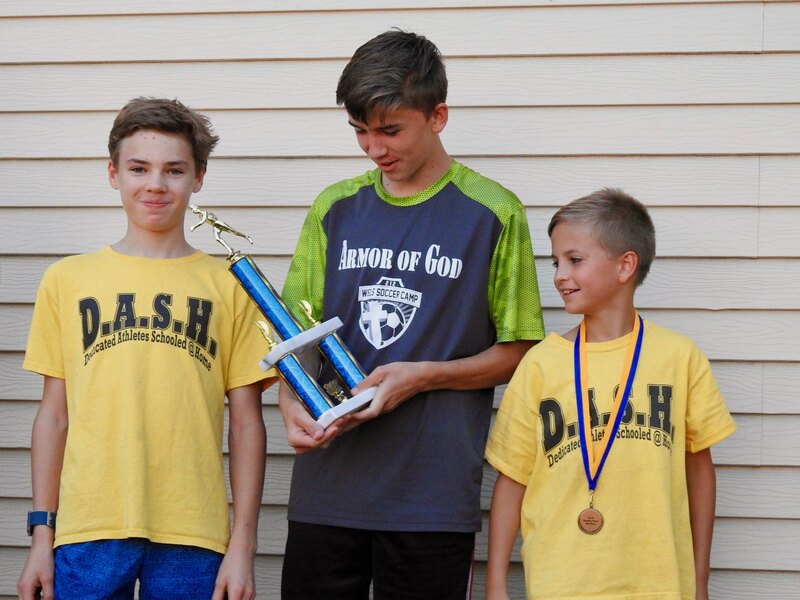 Our ‘A’ team of Jared Aguilar, Kevin Egan, Joshua Schaber, and Briel Holmes did the two laps in 1:43 for the 3rd place medals, and also laid claim to the DASH record. In the 400, Katrina Lipski got the team 2 points with her 7th place finish. Abby Chu earned the 3rd place medal with her personal record 1:11. Terez Wycklendt was in a class by herself, coming in for a big victory in 1:08.18. Ben Hughes was our only guy who made the start. Ben had been sick the last week and missed the last meet, but he still found the energy to post a 58.15. I liked that. With the teams plethora of sprinters, the boys ran two 4×100 teams, although I purposely made them rather close. The team I labeled ‘B’ of Kennard Taylor, Jacarie Rucker, Jerimiah Maxie, and Perryon Pierce bested St Joseph’s ‘B’ team. The team I labeled ‘A’ of Noble Holmes, Nathan Forget, Parker Lentz, and Joshua Schaber ran very well, had good handoffs, and eked out another DASH record with a 50.23. With our team speed, I expect that record to come down much more before the season is done. In the 300 hurdles, Alivia Kempf breezed to an easy victory despite her first hurdle being set 3 inches high. We had 4 boys in the same 300 hurdle heat. Matthew Hein showed his natural jumping ability with a nice 57.68 time in his first try at the event. Ben Forget posted a 54.28, good for 4th overall in his first try at the event. Joshua Below got through the 8 hurdles in 51.49 to win the 3rd place medal. Kevin Egan was on pace to get that medal, but was DQ’d while trying to carry the last hurdle to the finish. Kevin will get another chance to improve his closing technique at the next meet. We had 3 of the top 6 girls in the 800. Katrina had a great finish and was somewhat satisfied with her 6th place 3:36. Emma Taylor moved into top-3 medal position early and held off the girl behind her continuously to edge her by about half a second with a 2:55. Abby Chu got into the lead early and never let up to win by 1 1/2 seconds with a 2:51. The way the girls battled made it one of my favorite races of the day. For the boys, Matthew Schaber was back setting personal records. His new standard for the 800 is 2:44. Vincent Maurer set his own pr with a 2:26. Vince is posting even better splits in the 4×800. He is really running well. Alexander Taylor did a 2:25. He has never been faster, and Caleb Schaber made it 4 for 4 for the boys in the personal record category. Caleb cruised to an 8 second victory with a 2:12. He is getting close to the DASH record now. In the 200, Mary Katherine Sanchez jumped the gun and was DQ’d. Very unfortunate. Annika Lipski set a personal record 40.87. I will threaten her with a 3200 to help her break 40 soon. I am that mean. Stephanie Chu posted a 31.53. She did not get her usual great start, then she ran well. For the boys, Matthew Hein’s 31.86 will have me keep him in the hurdles, his better event. In the next heat, Ben Forget got the win with a very nice 27.39. Jerimiah Maxie followed with a 28.56. In the next heat, Perryon Pierce pushed himself to a nice 26.19. Kennard Taylor looked good before coasting in with a 28.26. Then Joshua Schaber was pushed along to a personal record 26.37. I was liking those times, and then in the last heat, I had Briel Holmes’ time in the 24’s. And this time I actually got it right – 24.49 was Briel’s official DASH record setting time. Wow! Now I was loving our speed. Then we moved on to the slower, more methodical, but just as exciting 3200. Joshua LeSac was found in a battle for the 3rd place medal that stayed close until the very end. A Dominican kid would push ahead of Joshua early in a lap, and then Joshua would surge ahead. It went that way until about the 5th lap. Then Joshua controlled the pace, finally surging ahead of him in the last lap. It took 11:34 of hard work from Joshua to lay claim to that medal. That battle was super exciting to any true track aficionado. With no letup in excitement, we were on to the 4×400. We gave Terez Wycklendt with hopes of getting an early lead and she did not disappoint, but the Catholic Central team was staying close. Emma Taylor ran the second lap and gave us a pretty comfortable lead before getting the baton to Alivia Kempf. Alivia Kempf ran the same split as Emma, but Central’s 3rd runner was very good and the lead was now only a few seconds. Stephanie Chu ran the anchor lap and kept that 3-second lead to the finish. The girls posted a very nice early season time of 4:43. For the boys, Jared Aguilar ran the first lap in 58 seconds, but so did the St Joseph athlete. We were to have a race. Liam Westhoff got the baton to the half way point in 1:55, but that was not good enough for the lead. Kevin Egan took his turn, but the St Joseph boys were showing some mettle, and Kevin was not able to make any headway into their lead. Caleb Schaber was our last chance. As it turned out, St Joseph ran their weaker runner last. Caleb got the lead on the back stretch and cruised to victory. We won by over 6 seconds in the end, but it was way more interesting than that. It is always a great day when we can leave with girls and boys 4×400 victories, so a great day of running it was. Field events were also held, but the quick pace of the meet gave the athletes trouble squeezing them in, and left me with seeing almost none of them. In the high jump, Emma Taylor got over 3’8″, and Alivia Kempf made 4’0″. In discus, Mary Katherine Sanchez threw 28′ in her first try at the event. Katrina Lipski hit 40′, Grace Zinkgraf threw it past 62′ for 4th place, and Lake Holmes won the 3rd place medal with a 75′ throw. Luke Smrecek had a nice 50′ throw, Alexander Taylor went past 60′, Jacarie Rucker’s was measured at 67’11”, and Noble Holmes now holds the DASH high school discus record as well as the middle school record. The new high school standard is 84’3″. Noble is amazing. In the shot put, Mary Katherine Sanchez got a new personal record. Katrina Lipski gave the team another 3 points with her 18′ throw. Annika Lipski hit 20’8″, and Lake Holmes hit the medal stand, breaking her own DASH record, with a 29’02.75″ effort. The photos of Lake throwing turned out very good. Luke Smrecek threw the 12 lb. shot 18′, Nathan Forget hit 24’9″. Ben Forget finally got to throw and did well hitting 26′. Jacarie Rucker was our best at 28′. In the long jump, Grace Zinkgraf and Stephanie Chu landed just short of 12′. Joshua Schaber did a 15’4″ jumping off the wrong foot. Noble Holmes launched himself 15’10”, and Briel Holmes tied the outdoor DASH record with an 18’02”, winning the meet by .75 inch. Nice. In triple jump, Joshua Below struggled to a 27’9″. Kennard Taylor hit 28’3″ in his first try at the event. I really like Freshman Matthew Hein in this event, and he did well with a 29’6″. Alexander Taylor was measured at an inch past Matthew. Liam Westhoff hopped, skipped, and jumped 35’01.5″. That’s more than a foot better than his old personal record. Liam will take home the 3rd place medal for his memorable jump, and get his name posted as the DASH record holder in the event. I was expressing my need for triple jumpers last year. Liam answered the call. The rest is history. That makes 8 DASH records total in the meet report, in case you weren’t counting. It was nice having a meet where everyone could participate if they were available, although that does make the meet reports a little long. The next three meets we will be breaking the team down into varsity/JV. 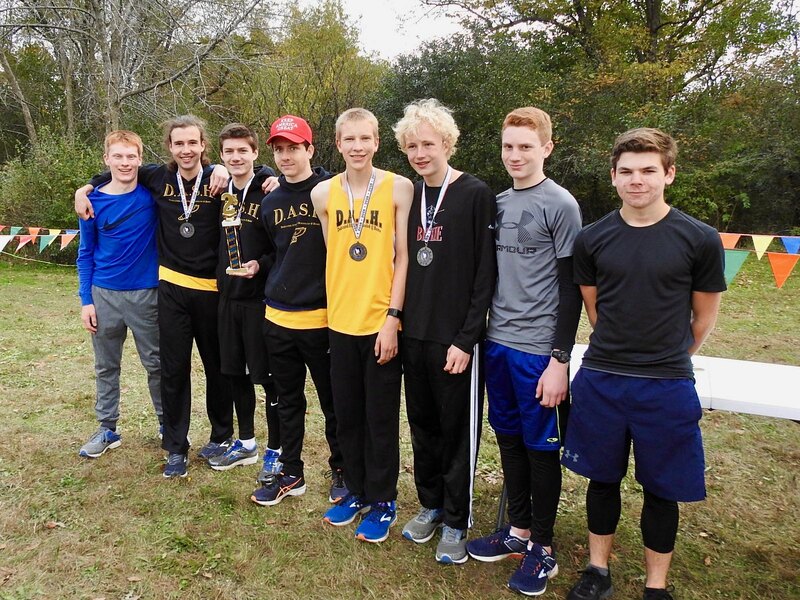 With so many boys this year, and so many good ones, it is going to be hard to leave some worthy athletes off the varsity team, but on the other hand those are the kind of problems that you hope to have. The biggest negative for me was missing out witnessing most of the DASH records set in the field events. I hope asking the athletes to break them again with the camera on hand is not too much to ask. Thanks to Ed Beck who helped out running the jumping pits, and helped our athletes get their starting marks. Thanks to Chuck Mauer and Greg Kempf for their coaching assistance as well. Thanks to Kenosha St Joseph folks for hosting, and for letting us in on running on the brand new track. 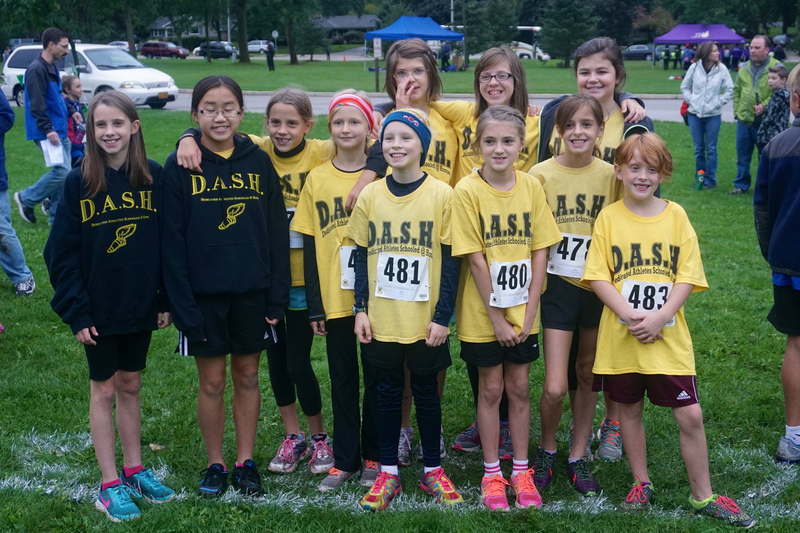 Thanks to all those that made the trek down to Kenosha to compete and to be DASH fans. Nobody had our numbers outside of the host team. I brought three photographers with me, but Faith Caspers ended up taking all the photos at the meet, with Grace Caspers finally getting camera duties at Culver’s. You can thank the photographers for getting some very nice photos once again. Now we turn our attention to the varsity meet at Sussex Hamilton, another new meet for us. I hope to see you there. The DASH high school boys track and field team opened up their 2019 season last Wednesday with their annual indoor meet at Waukesha South High School. Our boys team is very big this year, and we would only get to see about 60% of the team in action. But after a month of practicing, it was good to see some of our boys out there running, jumping, and throwing against some stiff competition. The field events got the day started. With only cold March practices behind them, we would see if our throwers and jumpers were ready. In the high jump and without any practice, Noble Holmes let his natural athletic ability get him over 5′. He looked good. In the shot put, senior Carter Lentz gave us a personal best 27’7″. Freshman Nathan Forget handled the 12 lb. shot well, throwing it 24’6″. In the triple jump, Alexander Taylor landed just short of 30′ in his first try at the event. Liam Westhoff looked very good while setting a new indoor DASH record of 33’10”. He now has the outdoor record in his sights. In the long jump, Joshua Schaber launched himself 17’10” before landing for a personal best. Briel Holmes just missed breaking the DASH record last year. 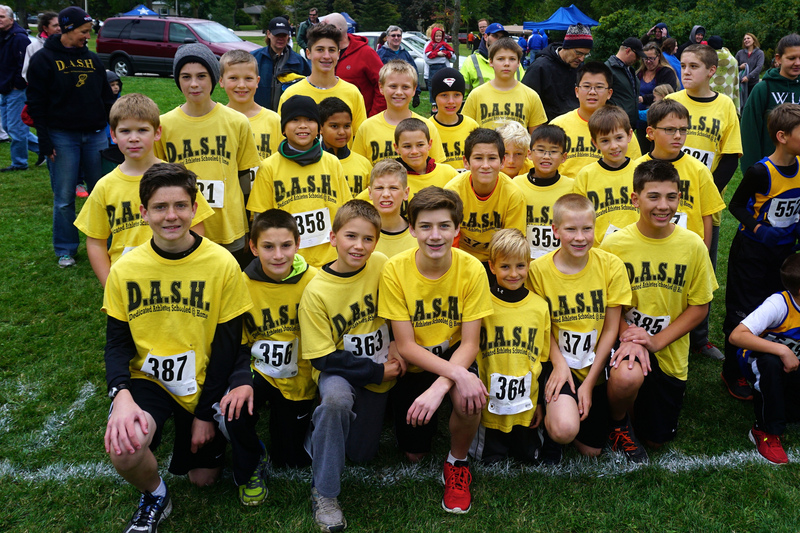 This year, on just his second attempt he became the first DASH athlete to go past 19′. And then with plenty of DASH fans gathered around, Briel almost jumped out of the sand pit. His epic jump measured out at over 20′! Yes, you read that right. The field events are going to be fun to watch this year. The boys have a good balance of sprinters and distance runners, and plenty of each. Forming good relay teams is almost too easy. The 4×800 team was first to race around with a baton in hand. Liam Westhoff put us in good position through the first 5 laps. Then Joshua LeSac, Jacob Parker, and Vincent Maurer kept the fast laps coming. The boys would place 3rd overall with a DASH indoor record 9:49. We have an impressive slate of high hurdlers this year and they all went head to head in the 4th heat. Noble Holmes hit the finish first with a 10.15. Carter Lentz and Joshua Below finished just a few tenths of a second behind, with all three boys getting under the DASH record. Very nice. Parker Lentz and Nathan Forget both blazed through the 60 yard race in under 8 seconds. Caleb Schaber won the mile by over 10 seconds with his 5:03 leaving no doubt who the best distance runner in the building was. Alexander Taylor was up by Caleb for awhile before settling for 5th place with a 5:31. The 4×240 relay team won their heat and placed 4th overall. Jared Aguilar got the boys into the lead which Parker Lentz, Kevin Egan, and Briel Holmes only increased. The boys clocked in with a 2:15 which lowered the DASH record by over 2 seconds. Most impressive. In the 400, Kyle Schlegel ran in his first high school race and posted a 1:12. Jacob Parker and Joshua Below raced in the next heat with Jacob posting a nice 1:02. Joshua fell back early but then finished with a 1:05. The 4×160 relay team of Noble Holmes, Nathan Forget, Joshua Schaber, and Briel Holmes weathered some heavy traffic in the exchange zones while working their way to a new DASH record 1:28. Breaking indoor relay records had become a trend. In the 60 yard intermediate hurdles, Joshua Below and Ben Forget both got through every obstacle put in their way and hit the finish in under 11 seconds. Vincent Maurer was back running an 800, but his time was over 10 seconds slower than his relay split. 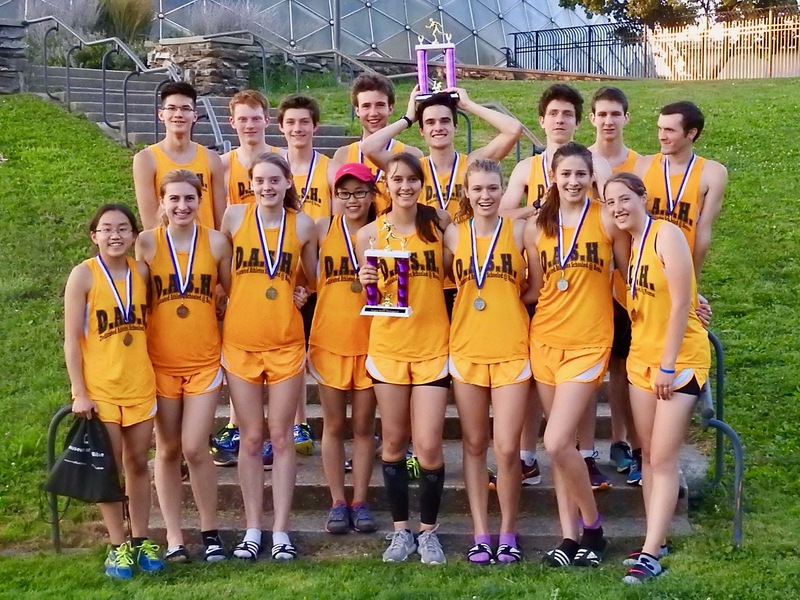 Distance running isn’t easy this early in the season. Matthew Schaber lowered his personal best 800 time considerably with his 2:49. His improvement over the last two years is immense. In the 200, Kyle Schlegel did the 1+ laps in 32 seconds. Joshua Schaber won his heat with a 27.85, just off his own DASH record. Ben Forget did not let the sharp turns slow him down as he put himself right behind Joshua on the all-time 220 yard indoor list with his impressive 28.01. Ben’s hard work is paying off. Joshua LeSac had already logged 5 laps earlier in the 4×800. Now he was back ready for the DASH fans to cheer him on for 20 more in the 2 mile race. Joshua ran the first mile like clockwork in 5:55, and then really kicked it in over the final 3 laps to claim 3rd overall with, of course, a new DASH indoor record time of 11:55. The building was pretty cleared out as we hit the 4×400, with the exception of a good number of DASH fans who stayed to see what proved to be maybe the most exciting race of the day. Jared Aguilar fell behind through his first lap and a half, but then closed the gap over his last lap and got the baton to Liam Westhoff in 2nd place. Liam put some space between the 2 teams behind him and closed the gap on the Franklin team with his blazing 59 second split. Kevin Egan then put us in the lead through his first lap, but the Grafton team was running very well and had taken over the lead as Kevin got the baton to our anchor, Caleb Schaber. Then through Caleb’s first lap, the Mukwonago team surged past us, but Caleb stayed patient and was within striking distance with a lap to go. It was now a close 3-team race. The Mukwonago team faded through the last lap while Caleb was only getting faster, his gaze fixed on the Grafton team still ahead. Both hit the home stretch side by side. The crowd was up. The crowd was loud. And then the crowd saw Caleb find one more gear. Caleb had proved the stronger, hitting the finish line just a few tenths of a second ahead of the Grafton team. The boys got the win, and it took a new DASH indoor record 4:01.04 to do it. We all exhaled, and put another great day of DASH racing in the books! Thanks to Coach Beck for his assistance with coaching and helping out with the jumpers. Thanks to Joshua Roets for his help getting Noble ready to high jump. Thanks to all the DASH fans for their support, and for their help in getting the athletes to the meet. Thanks to the coaches at Waukesha South for being so gracious and accommodating to us every year. Thanks to the camera crew of Grace Caspers, Julianna Caspers, and Faith Caspers. The photos were pretty good this time in the very tough indoor conditions. We now head to our outdoor schedule, and it starts tomorrow. I have 35 athletes signed up. I hope to see you there – in Kenosha. 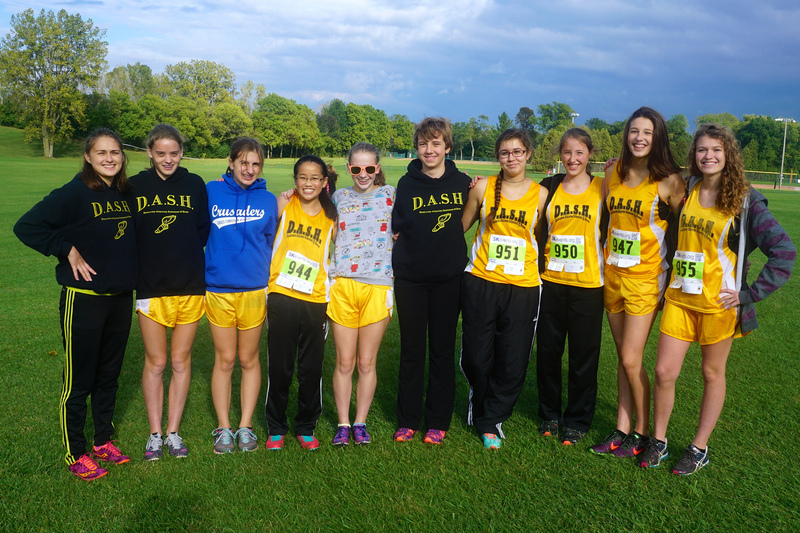 The DASH high school girls were at Waukesha South high school yesterday competing in a meet billed as the Preview Meet. 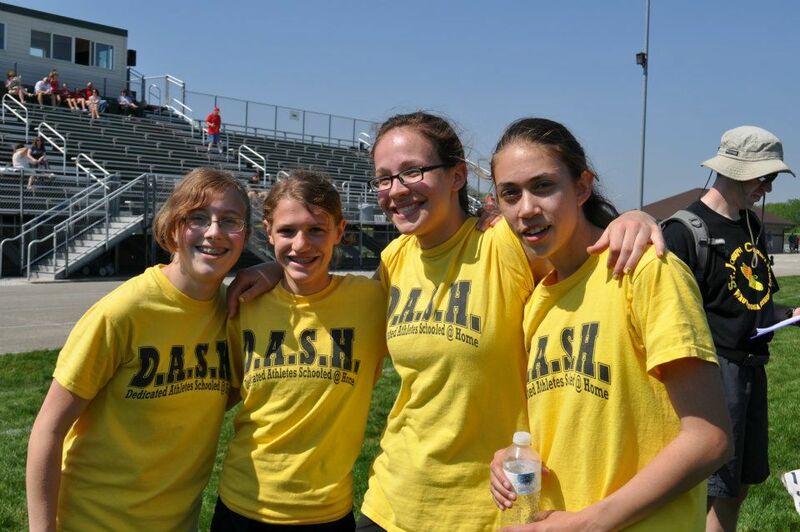 Five of our ten girls were competing in high school track for the first time. 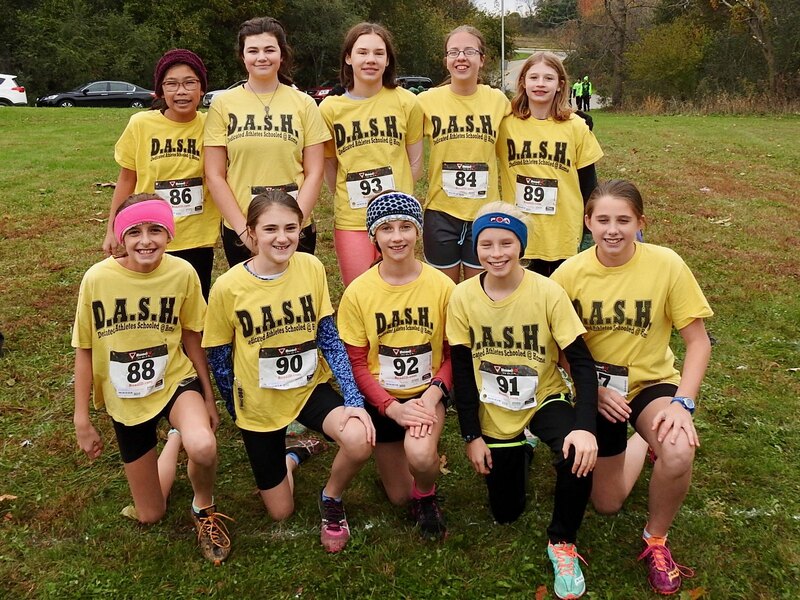 It would be a chance for the DASH fans to get a preview of our new girls skills, and a chance to see a handful of DASH veterans compete with very little practice time behind them in the warm, comfortable setting of an indoor track. Field events began at 4:30. Because of the cold March weather, the only practice any of our girls have had this year would be in warmups. The lack of practice showed in the high jump. Emma Taylor was very close on several attempts, but missed the opening height and turned her focus to her running events. In the long jump, Amelia Coleman showed off her talent. She peaked at 12’5″, but she landed her last jump near the end of the sand pit on a scratch. Once she gets her steps down, how far will he go? Annmarie Bridge equalled her best middle school jump with a 10’1.5″. That was a nice start to the season. Jaimee Heckenkamp was a couple inches shy of 10 feet. The talent is there, but her form is not where it needs to be, yet. Despite the calendar showing March 14th, our shot putters decided to be in mid-season form. Lake Holmes threw over 5 feet farther than her best from last year. Last year Lake was pretty good, so her amazing 28’9.5″ throw ended up smashing the DASH record by, (gasp), 3 1/2 feet! She had waffles for breakfast. You get asked those kind of questions when you throw like that. If not for Lake, Amelia Coleman could have been the story of the day with her 23’7.75″ throw. That was farther than any of our girls threw last year, and she hit that mark despite her form being a little off. Rebecca Doak gave us a third girl hitting 23′, and Annika Lipski had a personal record 21’6″. Needless to say this should be our best throwing team ever, if it isn’t already. Katrina Lipski throws just in case the team needs her. It looks like she can concentrate on running. Freshman Mary Katherine Sanchez is yet another girl with some throwing talent. I will report her marks once she gets some more practice. 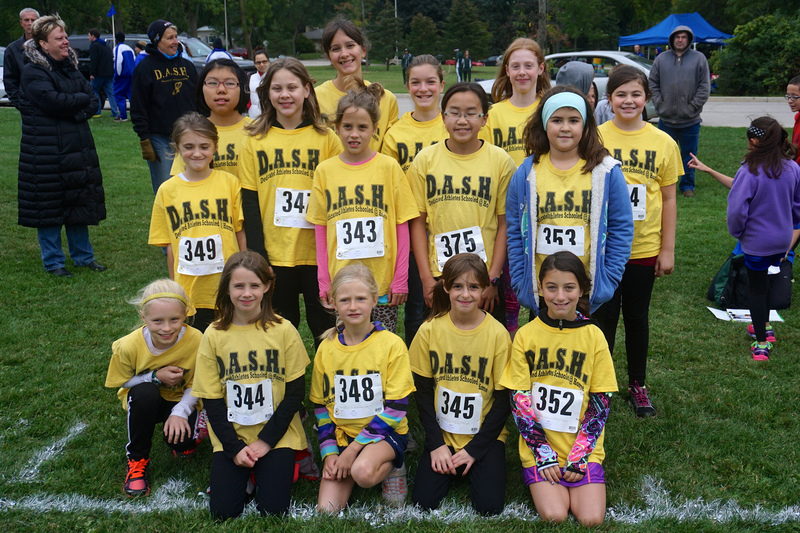 As the focus turned to the running events, the DASH sprinters were out first for the 55 meters. The DASH fans had a treat as we had a 5-girl all DASH heat up first. After showing off her field event skills, Amelia Coleman proved to be pretty fast, getting off to a good start and keeping her teammates behind her. Jaimee Heckenkamp gave Amelia a race finishing just .14 seconds behind her. Annika Lipski made her case for being a sprinter with a solid 3rd place finish in this heat. Annmarie Bridge was next and has the coach thinking of running her a little longer. Mary Katherine Sanchez stayed close to Annmarie, but she is new to track and needs more seasoning after being thrown into the fire at this early meet. Terez Wycklendt posted the team’s best 55 time with her 8.63. She did not have the best finish because she didn’t know where the finish line was. Because she is so fast, the coach forgets she is a freshman and needs more attention. Rebecca Doak also had a very good race, and finished just a half-step behind Terez. Having Rebecca back after a year’s absence has the coach so excited. Our 4×240 team of Jaimee Heckenkamp, Annmarie Bridge, Annika Lipski, and Katrina Lipski didn’t threaten the DASH record, but ran a very fundamentally sound race. The handoffs were good, the running was hard, the coach was happy. Jaimee posted the best split. All our 400 girls ran in the final heat which is what I was hoping for. Terez Wycklendt bolted into the early lead and was only threatened by a hard-charging Rebecca Doak in the last lap. When the times were posted, Terez’s 1:09.99 gave her a new DASH indoor record. Rebecca missed the old record by just a tenth of a second with her 1:11.2. DASH veteran Emma Taylor came in with a routine 1:16 early season indoor time, and was happy that Terez and Rebecca will be on her 4×400 team this season. 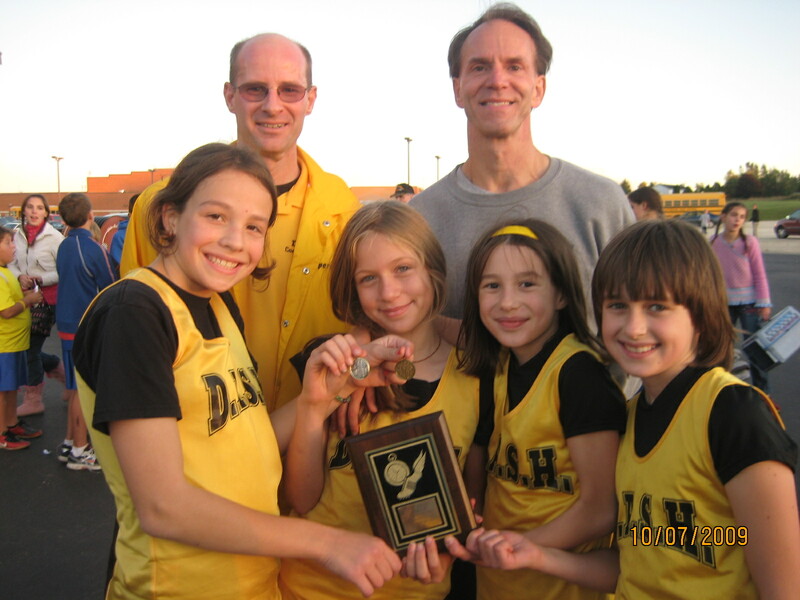 Our 4×160 relay team was almost the same as our 4×240 team with Amelia Coleman taking the place of Katrina. Again the girls passed the baton without a hitch after having only practiced in the hallway before the race. And they did beat one Division 1 team with their 2:02 time. Jaimee and Amelia came in with the best splits. Katrina Lipski raced in the first 800 heat. 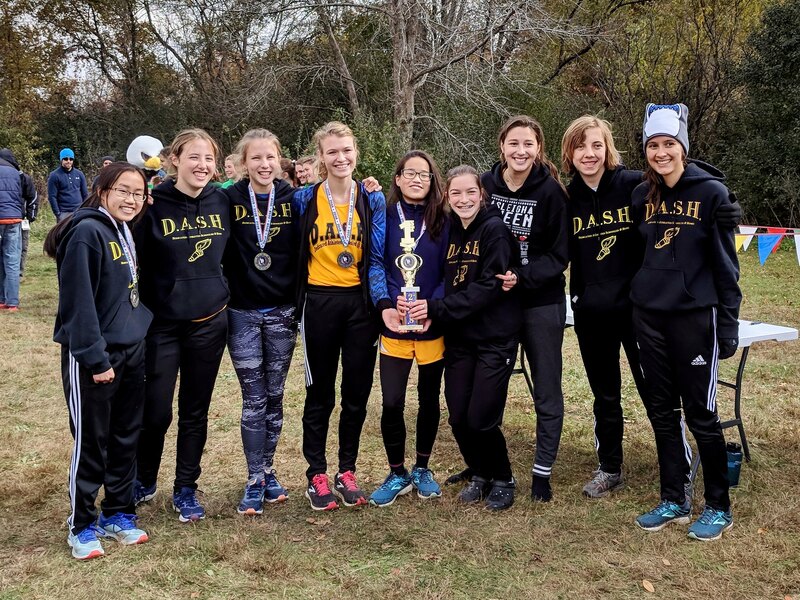 With the weather being so bad the last two months, the distance runners are not ready to post good times yet, and Katrina was disappointed with hers, but the coach thought she looked good under the circumstances. The same goes for Emma Taylor who ran in the next heat and previewed a 3:05. Those times will going way down in the weeks ahead. They always do. After a long wait, Mary Katherine Sanchez was back for the 200. She was a little overdressed in the warm indoor weather, but finished well. The DASH fans were a little depleted as the time neared 8 PM, but those that stayed got to cheer on the 4×400 team. Terez Wycklendt took the baton first and got us into a nice lead over her 2 1/2 laps before handing off to Emma Taylor. A couple teams started closing in on Emma, but Emma pulled away over her last lap before letting Katrina Lipski take over baton duties. The four teams behind Katrina all were staying close, and over her last lap it became an amazing close 5-team battle. Katrina put in a 1:36 split which may have been her fastest ever, and got the baton to Rebecca Doak in time for Rebecca to close in on and pass all but one team over the last 2 1/2 laps. We would post a 5:15 time, good for 2nd place getting the DASH fans excited one last time. We would leave happy with our results. Of course the meet exposed plenty of issues we will have to work on over the next few weeks, but the coaches have some talent to work with. Add in the fact that we only previewed about half of the full girls team, it looks like this years edition of the DASH girls high school team should be another good one. There is plenty more work that has to be done, and plenty more exciting results to be had over the next two months. It will take time to all come to fruition. While it comes to pass, I hope to see you there. 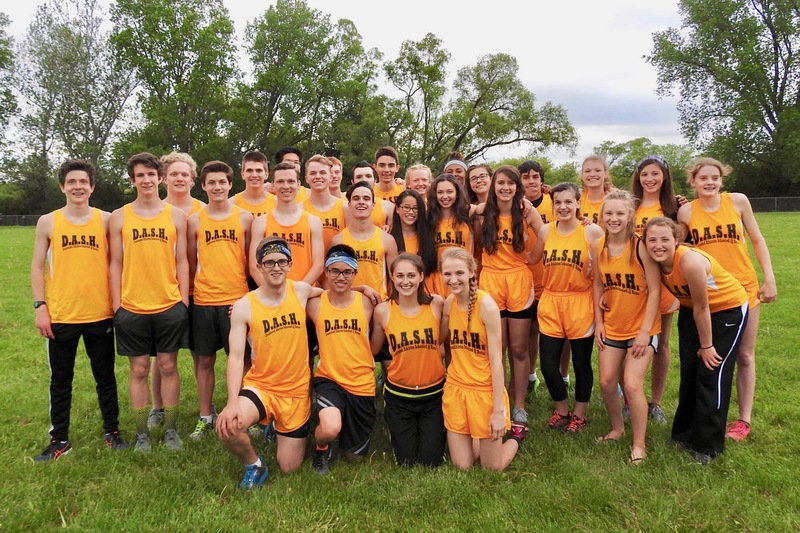 The DASH high school track and field team completed their abbreviated season at their usual setting – The Wisconsin School for the Deaf. Four teams were on hand, including one of our natural rivals, the Homeschool Eagles, who always make the competition a little more intense. The weather was perfect this time, giving the athletes one last chance to post some good results. Field events were first on the agenda. Jacarie Rucker threw his shot 29’10” to place 2nd overall. That was 2 inches farther than Brendan Sanchez’ personal record 29’8″. Carter Lentz did a 26’6″. Lake Holmes won the girls shot put by over two feet with her 22’6″ throw. Annika Lipski and Elisabeth Krmpotich also threw over 20 feet and placed 3rd and 4th. In discus, Will Farrell and Jacarie Rucker both had tosses over 72 feet to place 2nd and 4th. Brendan Sanchez’ 68′ throw placed him 6th in a very tight event. Our girls swept the top three spots. Lake Holmes led the way with a DASH record 81’11”. Elisabeth Krmpotich and Grace Zinkgraf were the only other girls to surpass 60 feet to complete the sweep. In high jump, John Klaves was declared the winner with his 5’2″ effort. Joshua Roets was close behind clearing 5′. Alivia Kempf made it to 4′ for the girls which was good for 2nd. Elisabeth Krmpotich and Emma Taylor had nice 3’10” jumps. In long jump, Briel Holmes placed 2nd with his personal record 17’11” leap. The DASH record will have to wait for next year. John Klaves jumped past the 17′ mark and Joshua Schaber hit 16’10”. It was a strong effort from the boys. Alexandria Sherman won a very close girls long jump with her 14’5″ leap. Kayla Bruton finished 3rd and Stephanie Chu’s 12’7″ put her 7th. John Boyce triple jumped 31’11”, good for 3rd. Julia Radewahn and Alexandria Sherman were the only girls over 28′, and Alivia Kempf gave us 3 of the top 4. With our strong effort in the field events we put ourselves in very good position in the team scores heading into the running events. Liam Westhoff got our boys 4×800 team off to a great start. From there Brian Durbin, Caleb Schaber, and Vincent Maurer eased in to victory while still posting a nice 9:43 time. Jessy Homa, Faith Caspers, and Abby Chu kept the girls close enough for Emma Taylor to move us into the lead late giving us another win. In the 110 hurdles, Carter Lentz, John Boyce, and Joshua Below swept the top 3 spots. Carter’s 20.39 lowered his DASH record. Grace Zinkgraf lowered her own DASH record with a 20.20 in a very tight heat. Alexandria Sherman won the first heat with a 21.94. The boys 100 was very fast. Jared Aguilar posted a 12.68 which was only good for 5th. Briel Holmes and Will Farrell ran well and placed 6th and 8th. Katie Gorectke and Lake Holmes went 1-3 in the first girls heat, then Kayla Bruton came from behind late to win by less than a step with her 13.66. Abby Chu placed 2nd in the 1600 with her 6:27. Faith Caspers came in 5th, and Katrina Lipski made a late charge to finish 6th. The boys race stayed close through two laps, then Caleb Schaber put some space between himself and the others to win by 4 seconds with a 5:03. Brian Durbin and Joe Maurer then sprinted in with 5:08 and 5:09 times. Our 4×200 relay teams both won pretty easily. Stephanie Chu, Grace Zinkgraf, Katie Gorectke, and Julia Radewahn got the baton around in 2:04. Carter Lentz, John Boyce, Joshua Schaber, and Briel Holmes did a nice 1:47. In the 400, Kayla Bruton gave us another victory with a 1:05. Emma Taylor was 3rd with her nice 1:09 effort, and Jessy Homa placed 6th. John Klaves led the boys with his 57.96 good for 2nd. Joshua Roets placed 5th, and Jacarie Rucker’s lap put him in 7th. Our girls 4×100 team unfortunately took a handoff outside the exchange zone. Our boys team of Jared Aguilar, Will Farrell, Jacob Parker, and Joshua Schaber lowered the DASH record and gave us another win. In the 300 hurdles, Alivia Kempf looked very good while placing 2nd in 56.65. Carter Lentz pulled ahead of Joshua Below down the home stretch to win the final heat in a DASH record 48.09. Joshua Below placed 3rd in the heat and will be looking to get his DASH record back next year. In the 800, Abby Chu surged to the front in the second lap to post the winning 2:47 time. Faith Caspers was 4th and Jessy Homa 6th. Brian Durbin, Joe Maurer, and Vincent Maurer went 2-3-4 for the boys. In the 200, our girls were superb. Kayla Bruton, Stephanie Chu, and Julia Radewahn held everyone off down the homestretch and gave us a 1-2-3 finish. Jacob Parker and Briel Holmes both posted times in the 26’s, and Joshua Schaber was clocked at 27.47. Joshua LeSac took the lead early in the 3200. It only got bigger as the race went along. His winning time was a nice 11:59. Stephanie Chu got the girls 4×400 team off to a great start. Julia Radewahn struggled at the end of her lap before getting the baton to Alivia Kempf. Alivia put up a good split, and Emma Taylor closed the gap in the closing lap, but the girls 4:44 time gave us a close 2nd. Jared Aguilar gave the boys the early lead. Then an Eagle started closing in on Joshua Roets until Joshua pulled away down the home stretch. John Klaves was then able to give us a nice lead before handing off to Caleb Schaber. Caleb gave the competition no hopes of catching him as he got to the finish in 3:58 giving us one last victory. 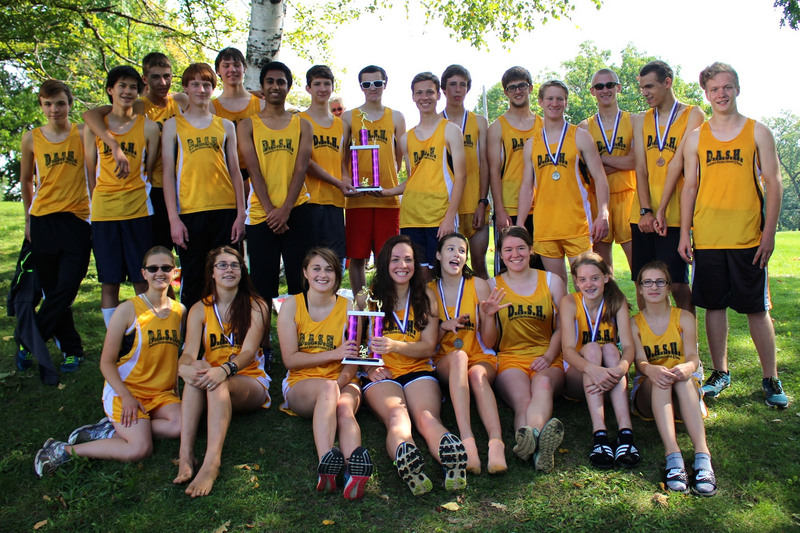 We did end up on top in both the girls and boys team scores. That is always our goal every year. The team really competed at a high level in everything. It was a great way to end the season and put the disappointment of so many cancelled meets behind us. Thanks for everyone for making the long drive out to Delavan. Thanks to our coaching staff of Ed Beck, Chuck Maurer, Greg Kempf, Garrett Missiaen, and Zipporah Caspers for being on hand. Thanks to the camera lady and Zipporah for catching the moment in photos. Thanks to the Wisconsin School for the Deaf for hosting another meet for us. And thanks to the athletes who stayed ready to compete while not getting many chances. We now have another successful season behind us, and we get to start thinking ahead to the cross country and track seasons next year. I hope to see you there. 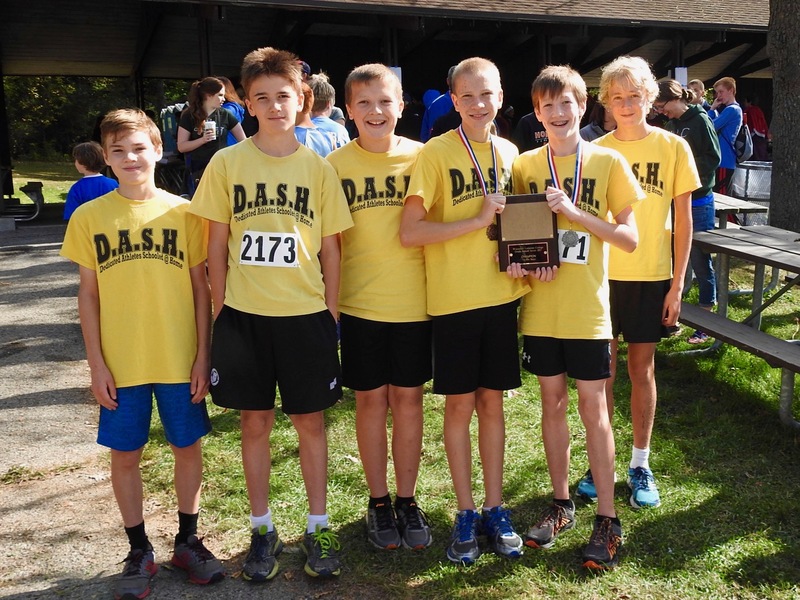 The DASH varsity high school team was in Union Grove last Friday to compete in the annual Pacer Relays hosted by Shoreland Lutheran. This is one of our ‘big’ meets, but it had a different feel this year coming after our first two meets that were cancelled due to snow. We would not be in peak form yet, but fortunately the other teams would not be either. To complicate things even more, the rain in the forecast held true along with wind chills in the 30’s. But with a little coaxing, the team was able to get all their scheduled events in, and leave with some respectable team scores. Our boy 1600 relay team was first. Vince Maurer opened with a 5:33, and in the next heat Caleb Schaber, Drake Hacker, and Joe Maurer all finished in the top-10 with 5:12 and lower times. That was good for the 2nd place medals for the boys, and got us off to great start. Our 110m hurdle team was led by Hiram Gleason who clocked in at 21.01. Joshua Below and Carter Lentz joined him in getting us the 5th place points. Our girls 4×200 team proved that it is always smart to field as many relay teams as possible. Annika Lipski, Abbey Retkowski, Georgia Gleason, and Katrina Lipski had some good handoffs and finished with a 2:21. That held up for 6th place after three teams were DQ’d with bad handoffs. Good job, girls. Our boys 4×200 team of Jared Aguilar, Briel Holmes, Liam Westhoff, and Joshua Schaber posted a descent time of 1:48 despite dropping the baton. Our girls distance medley team of Katrina Lipski, Georgia Gleason, Jessy Homa, and Faith Caspers stayed steady through the 10-lap race and finished 6th. The boys team of Timothy Kowalinski, Joshua Roets, Joe Maurer, and Caleb Schaber battled to a 5th place finish in a close race where the 2nd through 8th place teams were less than a minute apart. Now the rain started coming down pretty heavy making the rest of the meet much more uncomfortable for the athletes. Our girls 4×100 team of Julia Radewahn, Lake Holmes, Grace Zinkgraf, and Kayla Bruton finished just out of the points. That race was surprisingly fast compared to past years. Our boys 4×100 team of Jared Aguilar, Will Farrell, Joshua Schaber, and Briel Holmes lowered the DASH record by just a little. If the weather was better, the boys would have lowered it by a lot. After standing around in the rain a little too long waiting for their start, our 300 hurdle team of Carter Lentz, Joshua Below, and Hiram Gleason proved to be our best ever. Carter led the way with a nice 49.56. The rain and cold continued and now it took a little coaxing to get the girls to come out from under the tent. Because the coach knows he can always count on Katrina Lipski, she got the call to be a last minute replacement in the Sprint Medley. She was joined by Grace Zinkgraf, Julia Radewahn, and Kayla Bruton. The girls got down to racing and kept it close enough for Kayla to put on a surge at the end move the team up into 3rd place. Those 3rd place Pacer Relay medals will look good on these girls. Brendan Sanchez was next to answer the coach’s call as a last minute replacement in the boys Sprint Medley. Brendan, Will Farrell, Joshua Schaber, and Briel Holmes finished in 1:59 and displayed their mettle with some good racing. The girls 4×800 team of Katrina Lipski, Georgia Gleason, Jessy Homa, and Faith Caspers gave us a nice 6th place finish. The boys team of Vincent Maurer, Liam Westhoff, Josh Wynne, and Joe Maurer matched the girls and picked up the 6th place points. The much looked forward to Throwers 4×100 relay was next. On the DASH team, our throwers run much more in practice than others so we always have high expectations for this race. The girls team of Annika Lipski, Lake Holmes, Abbey Retkowski, and Grace Zinkgraf did not disappoint, keeping all but one team behind them while earning themselves the 2nd place medals. The boys team of Ethan Retkowski, Will Farrell, Brendan Sanchez, and Carter Lentz got the baton around very quickly and will also be showing off some 2nd place Pacer Relay medals. Very nice! 4×400 time had finally arrived. Julia Radewahn, Jessy Homa, Faith Caspers, and Kayla Bruton each gave us one more lap in the rain and picked the team up another 3 points for their efforts. Jared Aguilar, Joshua Roets, Timothy Kowalinski, and Caleb Schaber capped the night off with a 4:03. Except we were able to scrap together a coach’s relay team. Mrs. Aguilar got things started running in boots and a skirt. Mr. Sanchez then looked fast racing down the backstretch. Coach Caspers and Coach Mr. Beck finished up the cold and wet day of racing. I did not get to see the field events, but the results show we did pretty good. Lake Holmes led the girl shot putters with a 21′ effort. Abbey Retkowski and Annika Lipski had throws over 19′. Grace Zinkgraf and Abbey Retkowski had discus throws of 49′ and Annika Lipski did a 44′. For the boys, in shot put, Brendan Sanchez had a nice 28′ throw, Carter Lentz 26′, and Ethan Retkowski 23′. In discus, Will Farrell just missed the DASH record with his 79′ throw. Brendan Sanchez has a personal best 71′ effort, and Ethan Retkowski landed a 47′ throw. Joshua Roets had a good day in the high jump topping out at 5′. Our long jump and triple jumpers both surprisingly placed 4th overall. Briel Holmes had a 17’01.75″ leap, good for 10th overall. Hiram Gleason went past 14′ and Joshua Schaber jumped 13’9″. In triple jump, Liam Westhoff had a personal record 31’4″ effort. Hiram Gleason and Joshua Below had successful jumps which was better than most teams. In the team scores, the boys finished 7th out the 15 teams with 46.5 points. I call that a good day. The girls were 8th overall with 32 points. Considering we only had 11 girls this time out, that score holds up well. We have just three meets left on the schedule now. It seems like we should have more. With the hearty effort given this time out, I am confident the team will make the most of them. Thanks to everyone for sticking around as long as you did and not having us scratch any events. Thanks to the coaching staff for helping keep things organized. Thanks to Shoreland Lutheran for hosting, and getting us through another great meet. Unfortunately, the camera was put away early and I will not be posting any photos this time. Thinking positive, we should have our full team on hand this coming Thursday. I hope to see you there. 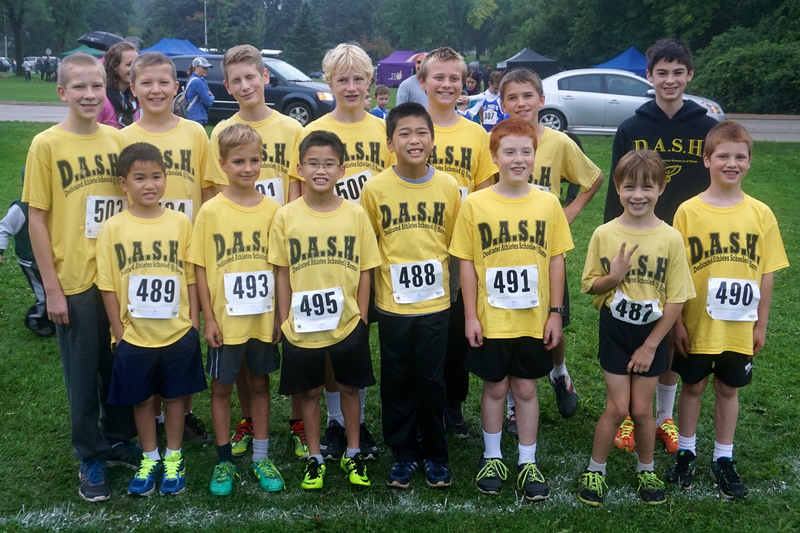 After two meet cancellations, eighteen DASH high school athletes competed outdoors for the first time this season at Kettle Moraine Lutheran high school yesterday. The weather was perfect helping the team post some very impressive results. Jessi McIntyre got the running day started by gracefully getting through the 100 hurdles in 22.76. Carter Lentz, Hiram Gleason powered their way, a little less gracefully, through the 110 hurdles with 20 nice second times. Ben Forget had trouble finding his rhythm and made it through in 24. In the 100, Alexandria Sherman posted a 15.30 in her first DASH race. Georgia Gleason and Jessi McIntyre posted almost identical times in the 16’s, and Naomi Zhou finished in just over 19 seconds. Jacob Parker led the way for the boys with his fast 12.80. John Boyce came in just ahead of Parker Lentz and John Shane, all with times in the 13’s, and Josh Wynne finished in 14.25. Joshua LeSac ran four laps in just 5:29. He has really improved since last year. Our 4×200 relay team of Carter Lentz, John Boyce, Ben Forget, and Liam Westhoff did very well and finished in 1:48. Jessi McIntyre was brought back by popular demand, and after a little cleaning up, to run a 400 and did well with a 1:23. Faith Caspers posted a 1:18 in the next heat. Matthew Kowalinski led the boys with a fast 1:04. John Shane looked very good while posting a 1:06. He has really turned into a runner. Josh Wynne did a 1:10 lap, and Timothy Tousignant warmed up with a 1:16. Our 4×100 team of Jacob Parker, Hiram Gleason, Liam Westhoff, and Parker Lentz got the baton around in 51 seconds, good for 3rd overall. The boys have plenty of depth in sprinters this year. The coach especially wanted to see the 300 hurdlers and they did very well. Carter Lentz and John Boyce both posted times in the 51’s, and Hiram Gleason came in with a 52. Ben Forget showed us some potential, and with a little more practice his 1:02 will be coming down considerably. In the 800, Naomi Zhou ran in the outside lanes through the first lap which hurt her time. Liam Westhoff’s very good second lap helped him to a nice 2:32. Josh Wynne’s very good first lap helped him to a 2:40. Daniel Caspers ran a steady 2:57. We had four boys going head-to-head in the same 200 heat. Jacob Parker led the way with an impressive 27.10. He was followed by Carter Lentz, Parker Lentz, and Timothy Tousignant. Joshua LeSac completed our day of racing with a 12:18 time over 8 laps. Nice. In field events our triple jumpers led the way. Alexandria Sherman posted a 29’6″ hop, skip, and jump which is the new DASH record. John Boyce triple jumped 32’6″, Liam Westhoff 31′, and Hiram Gleason went 28′. Faith Caspers long jumped for the first time in 2 years and did an 11’7″. Georgia Gleason also went over 11 feet, and Jessi McIntyre went over 8. For the boys, Hiram Gleason went past 14 feet, Jacob Parker and Parker Lentz both jumped past 13 feet, and Timothy Tousignant will be looking to improve his form. In shot put, Carter Lentz, Ben Forget, and John Shane showed the coach some potential, but were throwing after their running events which was unfortunate. We needed a meet like this where the weather cooperated and the athletes could post some times. That will help me get these athletes into the proper events in the meets ahead. Several of the athletes did much better than I expected. You can’t ask for more than that. Now we get to start thinking about the Pacer Relays today, and the Waukesha South outdoor meet next week, and beyond. I hope to see you there. Thanks to Kettle Moraine Lutheran for hosting such a well run meet and not cancelling on us. And thanks to the camera crew of the camera lady, Daniel Caspers, and Faith Caspers for getting some nice photos. It is nice to be kept busy with track work. It beats shoveling snow. We got to see a portion of the 2018 version of our high school boys team for the first time last Friday night at Waukesha South high school. 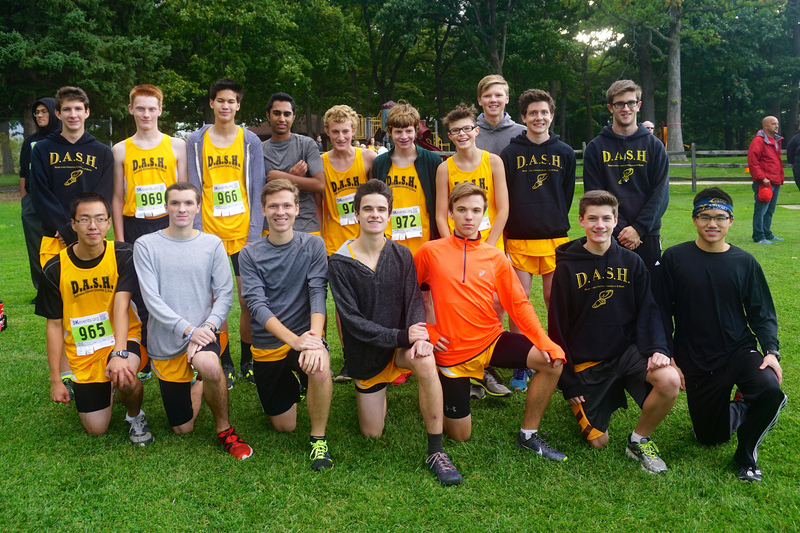 Eighteen of our boys suited up to compete against 13 other big schools in the area. This is one of our most talented teams on paper. The time had arrived to see them in action. Field events were first on the schedule. John Boyce triple jumped for the first time and landed a 32’5″. That’s just 2 feet short of the DASH record. Joshua Below set a personal record with a 30′ effort. In the long jump, Briel Holmes and Joshua Schaber became the 5th and 6th DASH athletes to go past the 17′ mark and the first two to do so indoors. Joshua Roets cleared 4’6 in the high jump. John Klaves had cleared 5’4″ until the bar fell down as he was getting off the mat. He settled for 5’2″. Brendan Sanchez got off to a good start, throwing his shot 29’4″. Carter Lentz muscled it past 26′. This years team looks to be making field events one of our strengths. Our experienced 4×800 team was seeded 2nd and that is where they finished. Brian Durbin, Tim Kowalinski, Vincent Maurer, and Caleb Schaber raced the baton around the track 20 times in 9:52 for a new DASH indoor record. Joshua Below broke 11 seconds in the high hurdles. Freshman Ben Forget held up well in his first high school event. In the 60 yard DASH, Briel Holmes, Jared Aguilar, and Carter Lentz all got into the same heat. All three broke 8 seconds with Briel edging Jared by .1 second for a new DASH record 7.38. We have plenty of speed this year. In the mile, Joe Maurer stayed with the pack for the first half of the race. He then made a surge to the front and dropped everyone finishing in 5:13. Joe looks ready to have a big year. Our team speed was on display again as our 4×240 team of Jared Aguilar, John Boyce, Parker Lentz, and John Klaves lowered the team record by two seconds. Joshua Roets took the lead early in the final 400 heat, but then struggled coming in just ahead of a surging Tim Kowalinski. Joshua had hurt his hamstring and called it a day. It is good we don’t have a meet for a few weeks. The 4×160 relay was next, and yes, the boys came in just ahead of the DASH record we set last year. The new standard set by Carter Lentz, Jacob Parker, Joshua Below, and Joshua Schaber is 1:29.59. Nice. Ben Forget was back hurdling in the low hurdles. He came in just ahead of John Boyce. Our hurdlers need a lot more practice, but are very promising. In the 800, Vincent Maurer faded a little at the end, but posted a respectable 2:39. Brian Durbin got stuck in heavy traffic throughout, but managed a 2:25, and Caleb Schaber was able to break out of the pack and post a really good 2:19 early season time. In the 200, Joshua Schaber was able stay just ahead of freshman Jacob Parker. Joshua and Jacob both broke the DASH indoor record with Joshua going under 28 seconds. Briel Holmes struggled with the sharp turns, but still managed a 28.28. All three were in the top nine. Joshua LeSac took the track next for his first 2-mile. Joshua looked very comfortable pounding out the 20 laps and exceeded all expectations with his 12:22 3rd place finish. We had three scratches for the 4×400, but our revised team of Carter Lentz, Jared Aguilar, Joshua Below, and Joe Maurer all gave great effort to finish the day of racing with a 4:17. I have never had a team with this much speech or jumping ability. 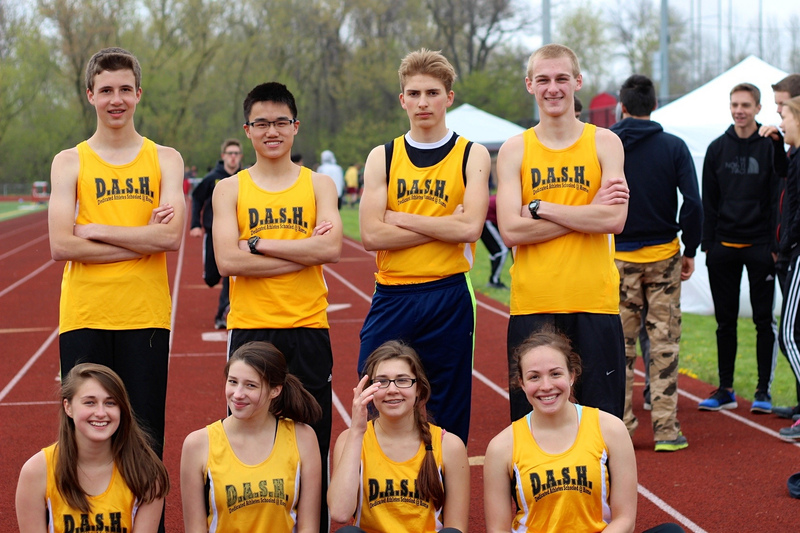 Our distance runners also look very good as usual. We have two of our varsity discus throwers back and some talent at shot. I am sure you can tell I am excited about the boys prospects in the meets ahead! I hope to you there. Thanks for Ed Beck and Chuck Maurer for being on hand to help with the coaching. Thanks to our team of photographers, Daniel Caspers, Faith Caspers, and Julianna Caspers. In all but a few events we have great photos. Thanks to Waukesha South for letting us compete once again in their indoor facilities. And thanks to the numerous DASH fans who came out to see the boys and cheer them on. It was fun. 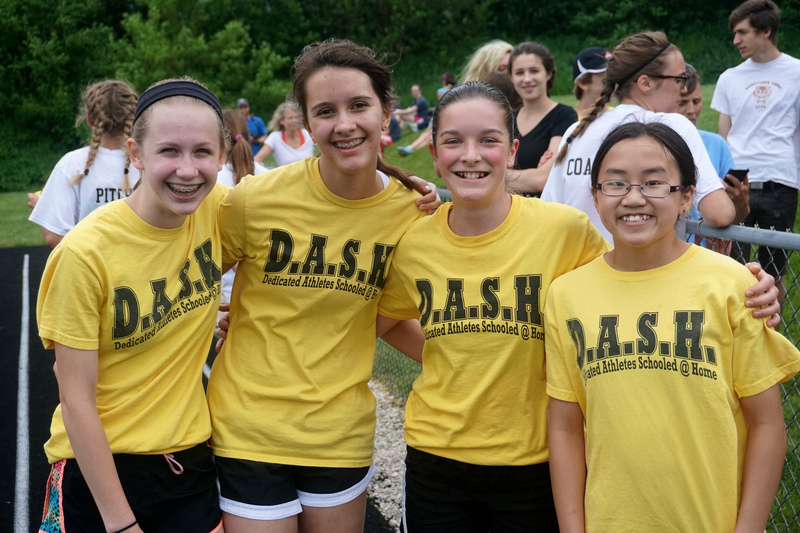 Enter your email address to follow the DASH Blog and receive new posts by email. 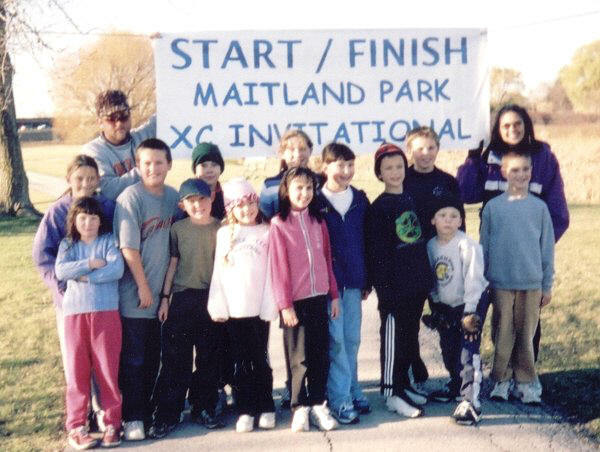 Legendary race - Maitland Park This is where it all began.